The EU has a comprehensive trade agreement with Colombia and Peru which has been provisionally applied with Peru since 1 March 2013 and with Colombia since 1 August 2013. Ecuador joined the free trade agreement (FTA) on 1 January 2017 but is not covered in this report. At the time of ratification of the FTA by the European Parliament, in December 2012, a research report warned about the risks from particular aspects in the trade agreement, namely increased money laundering and tax avoidance, due to FTA provisions such as free movement of capital and liberalisation of financial services. A comprehensive research report on the inclusion of financial services in EU free trade and association agreements by the ex-post impact assessment unit of the European Parliament, confirmed those risks. In contrast, the EC’s third report on the implementation of the EU – Colombia & Peru FTA does not mention any of these risks and issues that have an important impact on particular parts of society and economic sectors. A recent Parliamentary report to evaluate the EU – Colombia & Peru free trade agreement mentions different EU initiatives with Colombia and Peru on money laundering, drug trafficking and tax issues outside the FTA. This report intends to raise particular issues that need to be taken into consideration when the EU – Colombia & Peru FTA is being evaluated and discussed, in order to take action to reverse negative trends regarding illegal transactions, foreign investment and the financial sector. 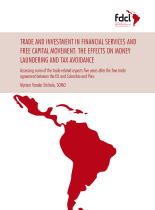 Studie: Trade and investment in financial services and free capital movement: The effects on money laundering and tax avoidance. Commisioned and published by: FDCL e.V. Diese Broschüre ist lizenziert unter einer Creative Commons Namensnennung – Nicht-kommerziell – Weitergabe unter gleichen Bedingungen 4.0 International Lizenz (CC BY-NC-SA 4.0).